Assembled the Raspberry Pi, the aes220 High-Speed USB FPGA board and the Pi camera together today. 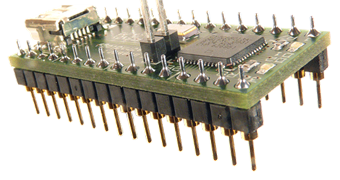 The FPGA is used as a man in the middle in this configuration, processing the images before they reach the RPi. Although it is now possible to hook more than one camera to the FPGA. 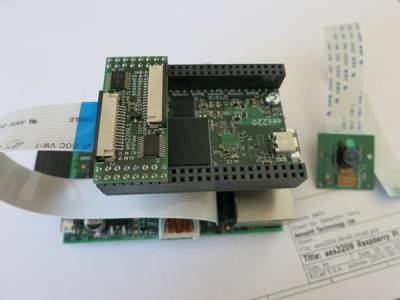 Non image related communication between the FPGA and the RPi, is possible via the USB ports or via the GPIO interface using the aes2208 daughter board. 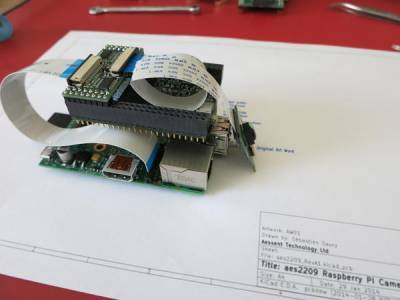 The aes220 accepts three aes2209 Piflex daughter boards so it is possible to link up to five cameras to the Raspberry Pi or six to the FPGA if not using a Raspberry Pi. The signals between the camera module and the RPi are 1.8V since the FPGA banks are 3.3V a voltage shift is required. 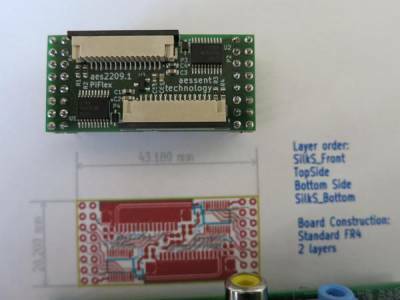 That is handled by the two TXB0108 from TI (one for each connector) on the aes2209 Piflex daughter board. Of course there remains all the programming to be done. But at least the hardware is now in place.